Stainless Steel Kitchen Knives Just $21.99! Down From $90! You are here: Home / Great Deals / Amazon Deals / Stainless Steel Kitchen Knives Just $21.99! Down From $90! Head over to Amazon and score this “Best Seller” Stainless Steel Kitchen Knives for just $21.99 down from $89.99 PLUS you will receive a melon slicer when you purchase this item! How cool is that? It’s FREE shipping with Amazon Prime or for orders over $35! It is made with premium stainless steel, a metal that will never tarnish, rust or corrode! These knives and handles are a solid one piece design. Never worry about the knife will crack or break like plastic, glassware, wooden, color, and ceramic knifes, or coming apart! EVERY KNIFE YOU NEED! This 6 pc. set includes 8″ chef, 8″ bread, 8″ carving, 5″ utility, & 3.½” paring knives for food prep and serving. & acrylic stand, for beautiful chef gadgets kitchen & baking cookware collection. HIGH QUALITY, Our knives are made to meet the demands of the pros it is premium stainless steel, a metal that will never tarnish, rust or corrode, – All blades are made with strong heavy duty restaurant grade # 430 stainless-steel, – our sets comply with certification from FDA, LFGB, SGS for the home and commercial use. EASY TO HANDLE & MAINTAIN, Our classic lightweight knives is Tapered handles fit perfectly in your hand to maximize control and ensure comfort when you’re cutting, slicing, mincing and chopping fruit, meat, sushi, and salad dish and all foods & cakes. – These knives and handles are a solid one piece design. Never worry about the knife will crack or break like plastic, glassware, wooden, color, and ceramic knifes, or coming apart. 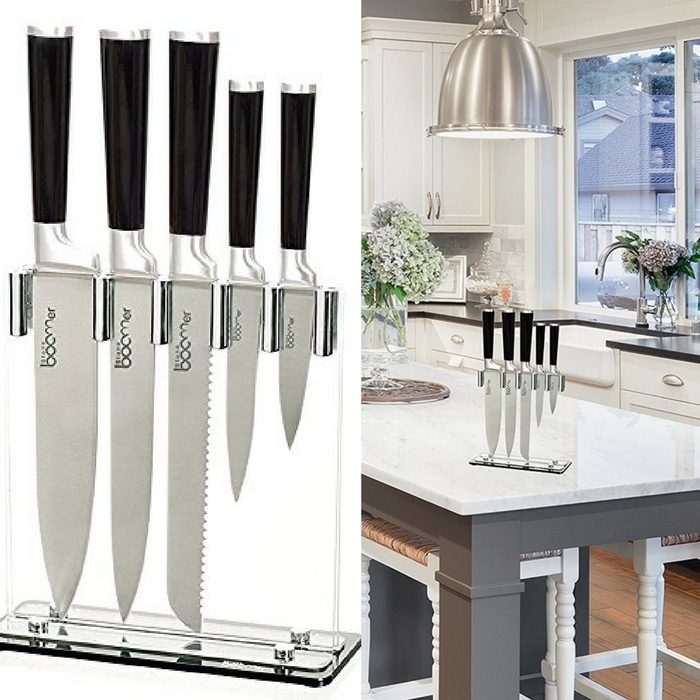 MODERN DESIGN, With our professional, nice modern glass knife block on your counter will will make your mornings easier and brighter, – plus with our beautiful design box is it ready to be gifted, for great wedding, hostess, BBQ or culinary school gift. even better, gift it to yourself – you deserve it!